Garbage Pail Kids Collecters World Wide. The BUENOS AIRES TOY MUSEUM.ARGENTINA. Rare gift cards that came in the packets. red packets with hard to get Flyers or Leaflets! Hand made and one of a kind. See what the inside of the album looks like. ALL original "Basuritas" from Argentina. In Spain they are know as,"La Pandilla Basura".In France as "Les Crados" and in Italy as "Sgorbians",in Israel,"Havurat Ha'zevel", Japan "Bukimi Kim", Norway and Africa "Garbage Gang" , so world wide collecters,get your set today from Argentina! Read on for more information, Bob Frassinetti. I have the original series "one" and "two" for sale, as loose cards, as well as the original early 1990s Black Album, sets of 189 card, Holofiol cards the 44 trading cards and all other sets and albums & sets like the 144 one,going all the way to the Basuriats 2 and now the 3 EDITION from the early part of 2004, and for sale world wide ......... 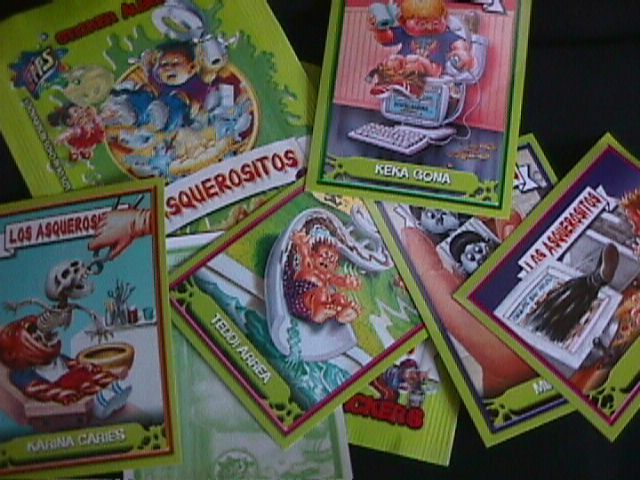 Garbage Pail Kids sets made in Argentina. 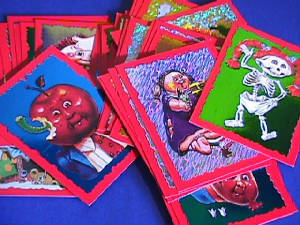 Grabage Pail Kids trading cards are famous all around the globe. The American designer genius who came up with those motives is worshiped and beloved, for his creations are an outstanding acid humor version of the traditional girls’ dolls the Cabbage Patch kids. Inspired in the American version many countries have developed their own GPK series. Among the most famous ones are the Argentine version, which not only combines funny and wicked images but also words games with the first and last name. All the same the Argentinean designers have added some new motives and series. 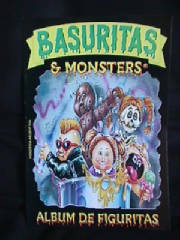 The Spanish brand was inspired in the American GPK: Basuritas –local translation for the garbage ones. The first series was released in the early 80s. During those days there were many re-releases. 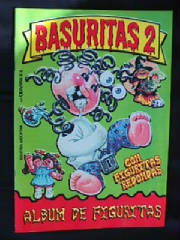 The early 90s welcomed us to a new and weird GPK Argentinean version: Basuritas & Monsters ( there are some variations of this model ) which featured the early models altered and with new and interesting inputs. 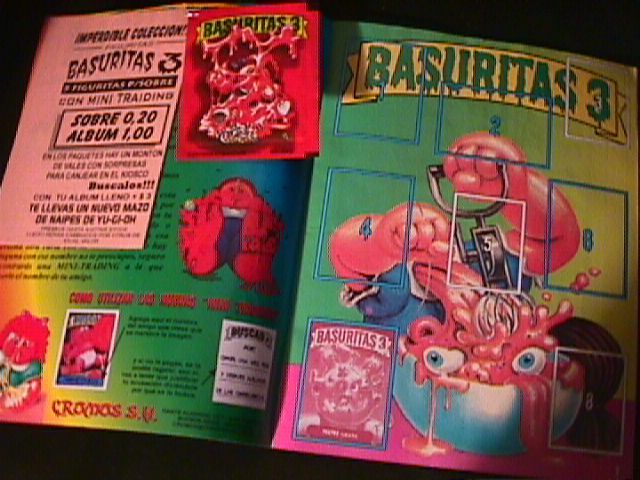 The evolution of these trading –collectibles has been impressive from every perspective, though there were some variations and alterations, once the designers returned to the original pattern the latest Basuritas 2, the then re release and the less known, but equally interesting Basuritas 3 released early in 2004 had impacted considerably in all fans and collectors. For the admiration and interest raised by all these fabulous characters, the Buenos Aires Museum’s latest input to the collectibles world has been terrific. 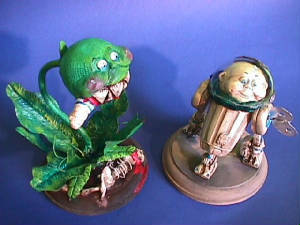 Scale handcrafted sculptures of each and every one of the Basuritas characters are the obvious and necessary step in the world of GPK collectibles. Their quality and uniqueness, for each sculpture is specially crafted and there are no castings or serial models, its an artwork based on an other piece of art which is the trading card design. The world of GPK is growing increasingly. It couldn’t be either way when the subject of matter is so interesting and stimulating for the eyes and the intellect! Some information on the Buenos Aires Toy Museum. I would like to inform all readers on this web site, of the activities of the Buenos Aires Toy Museum, a virtual museum on the internet, where I am working on a research project on vintage toys and games from Argentina. This website is not only a virtual museum with permanent exhibitions, but also has information on shown items, their history and their cultural significance to Argentina, Latin America and world wide. We cover hand made toys as well as industrial items, objects abandoned in the last decade in favour of electronic video games. The Buenos Aires Toy Museum is intended to be a gathering point for those looking for collectors items from Argentina or information on them. I am the creator of the museum, an antique dealer and collector, interested in all kinds of toys, including robots and space toys. With the help of Florencia Rodriquez, and Julian Rodriquez the museum has tackled many research projects on vintage toys. This group of three young university students works full time on the project, putting their heart and soul into the museum. They are working on two books, one on Argentine diecast cars, the other on toy robots, both soon to be published. We invite visitors to the website at www.ba-toymuseum.com.ar. The Spanish version has been updated and we are in the progress of updating the English one. Or you can contact me: Bob Frassinetti. Shipping to any part of the world.In photo's on the left you will see what the albums and cards look like,as well as the loose cards, full sets, etc,.......need to see more or need more information,email me for thiss. They are the best GPK I have seen! Payble either with PayPal or XOOM Payment,(for my ebay auctions,see eBay ID: Bob_Frassinetti ) or some other on line banking method that we can work out in any part of the world. Best wishes from Argentina, Bob Frassinetti. Hand made,scale custom made with fine handcrafted, these unique sculptures of each and every one of the Basuritas characters are the obvious and necessary step's that collecters are taking, once you have collected all of the items possible,what more can you do, so GPK's in the world, believe. Their quality and uniqueness, for each sculpture is specially crafted and there are no castings or serial models, its an artwork based on an other piece of art which is the trading card design.A one of a kind collectible being done by us from the Toy Museum. Did you know? 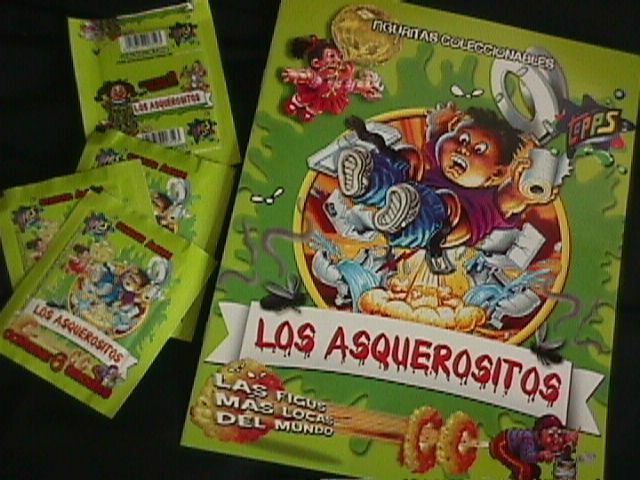 Just out in Argentina, October of 2004, "Los Asquerositos" Printed in Peru, sold in Argentina, GPK type cards, like Basuritas, album,was printed in Argentina, its green as well as packets.See photo....... each packet comes with 6 cards, album for 175 insert cards. Made by TOPPS (trade mark) developed and distributed by Topps Argentina, SRL. Packs, cards and back of cards. Printed in Peru for Argentina. Questions or comments? Get in touch with us at:Thank you for reading,Bob Frassinetti. Updated February 2017. Trading Cards Argentina.